Rid surfaces of mildew with McKee's! McKee's 37 Marine & RV Mildew Remover is a fast, safe way to remove mildew from your boat or RV. This eco-friendly formula annihilates mildew with a few pumps of the trigger! It's loaded with state-of-the-art cleaners instead of volatile chemicals so it's safe for use on virtually any surface including vinyl, gel coat, fiberglass, canopies, rubber fenders, grout, showers, countertops, sinks, and more! • Easy to use — just spray and wipe! No matter where you live, what you drive, or what your hobbies are one thing is for certain: Any place exposed to moisture is susceptible to mildew growth. And let's face it, cleaning mildew isn't fun or glamorous, or particularly rewarding, but it has to be done. That's where McKee's 37 Marine & RV Mildew Remover comes into play. This gentle, yet effective cleaner makes its easy to remove even stubborn mildew stains with minimal effort. This product isn't like other high-test mildew removers that use bleach and other harsh chemicals that can damage the surface being treated. 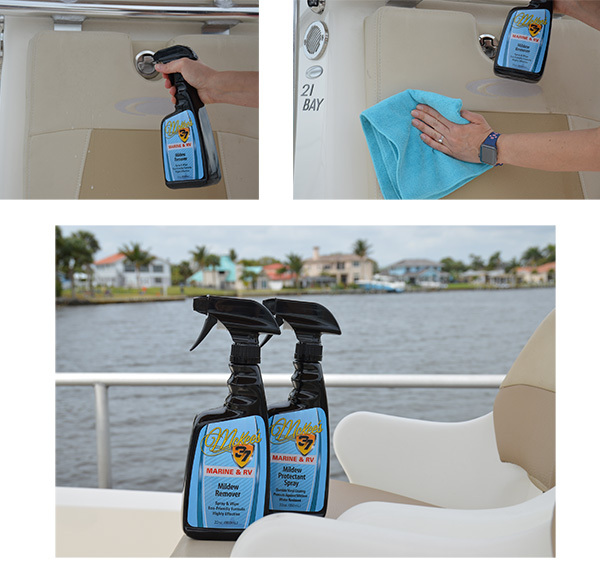 Instead, McKee's 37 Marine & RV Mildew Remover uses smart chemistry to remove the mildew without the risk of discoloration, over drying, or dulling of surfaces. Simply spray it on, allow it to dwell for a few minutes if desired, then wipe clean using an old towel. Prevent future mildew growth by following up with an application of Mckee's 37 Mildew Protectant Spray to seal the surface. McKee's 37 Marine & RV Mildew Remover is easy to use and quickly provides a clean and mildew-free surface! 1. Spray directly onto surface and wipe clean using an old towel. 2. Stubborn mildew stains may require 3-5 minutes of dwell time before wiping clean. 3. Remove remaining residue with a strong jet of water. 5. Follow with McKee's 37 Mildew Protectant Spray to seal the surface, preventing mildew growth. McKee's 37 Marine & RV Mildew Remover 128 oz. McKee’s 37 Marine & RV Mildew Protectant SprayMcKee’s 37 Marine & RV Water-Resistant Vinyl ProtectantMcKee’s 37 Marine & RV Gloss Enhancing Final PolishMcKee's 37 Marine & RV Hydro Pearl Sio2 CoatingMcKee's 37 Marine & RV Final Step Detail WaxMcKee's 37 Marine & RV All-In-One Fabric & Vinyl CleanerMcKee's 37 Marine & RV Carnauba Wash & WaxMcKee’s 37 Marine & RV Heavy Duty Cleaner WaxMcKee’s 37 Marine & RV Repel Glass & Plastic CleanerMcKee’s 37 Marine & RV All Purpose Surface CleanerMcKee’s 37 Marine & RV Bug Remover & Wax RestorerMcKee’s 37 Marine & RV Vinyl Decal & Graphic RestorerMcKee’s 37 Marine & RV Heavy Cut Oxidation RemoverMcKee’s 37 Marine & RV Carnauba Sealant WaxMcKee’s 37 Marine & RV One-Step Polish & SealantMcKee’s 37 Marine & RV Repel Glass & Plastic Cleaner 128 oz.McKee's 37 Marine & RV Final Step Detail Wax 128 oz.McKee's 37 Marine & RV Carnauba Wash & Wax 128 oz.McKee's 37 Marine & RV All Purpose Surface CleanerMcKee’s 37 Marine & RV Bug Remover & Wax Restorer 128 oz.